Some medical compliance software — as part of practice management solutions — are better at fully complying with some or all of these medical compliance standards than others. 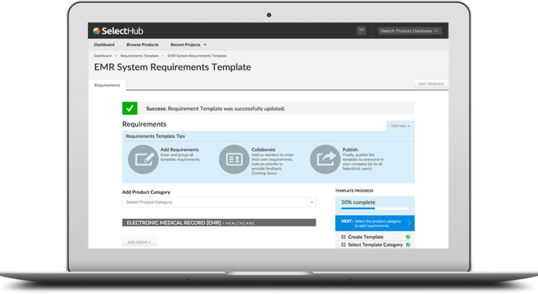 We compiled a list of medical compliance systems highest-rated specifically for compliance features. Never worry about your patient data when you utilize one of these platforms in your medical practice! Kareo includes robust functionality that can have a positive effect on how a practice works from day to day. This solution allows users to work with ICD-10 diagnostic codes (ICD refers to the International Classification of Diseases, the 10th revision of which was released in 1993.) Users can also work with other identifiers to triage claims and work with contractual agreements with insurance companies to provide a comprehensive medical billing service. This PM medical billing software automates many aspects of the revenue process that are often burdensome for a small practice. It’s designed for small to mid-sized practices and is invested in their clients’ comfort and success with the system. Kareo assigns a success coach to every user for the first 90 days. Users can get in direct touch with a coach to resolve questions and concerns. Kareo’s systems are compliant with HIPAA to ensure the privacy of patients’ information. It’s also ICD-10 compliant and helps users code data sets accurately to ensure accurate transfer of information. The electronic claims transmission feature is used to send insurer-specific and electronic claims swiftly. Kareo’s commitment to security includes providing its services on a highly-secure and controlled platform in company-owned data centers. Kareo does this by implementing best practice security frameworks using both in-house and third-party tools and services. It also obtains industry certifications and independent third-party attestations. Some other security features Kareo implements are third-party audits, external threat assessments by outside agencies, administrative safeguards, data encryption, strict expectations for data handling and secure networking measures. 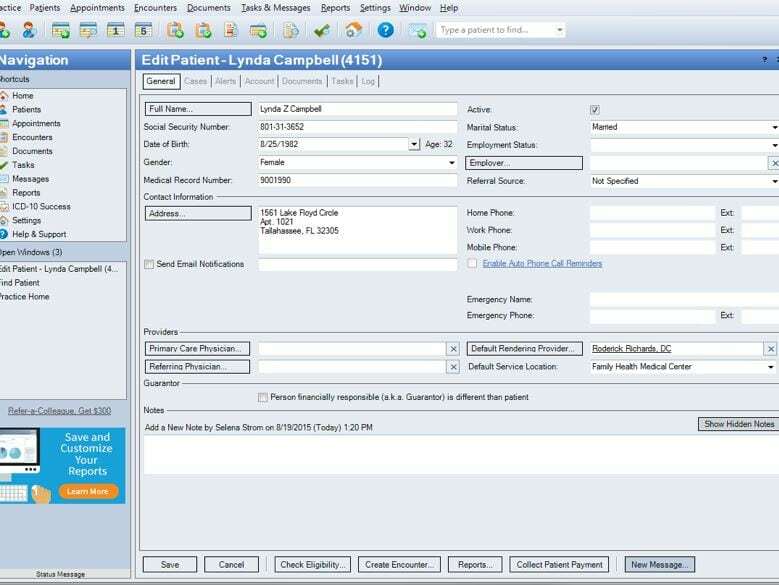 This medical compliance system ensures that users keep all patient records safe and sound. MediTouch provides a centralized patient database that allows users to access patient records from their desktop, tablet or smartphone. The solution records patient demographic and social history information in an easy-to-access database. Medical professionals can import patients’ Rx medication history from SureScripts. This allows them to perform advanced checks for drug interaction and allergies and assists in determining adequate dosage limits. MediTouch’s YourHealthFile Patient Portal helps users manage workflow by allowing patients to book appointments, to view lab test results, to receive billing updates and to communicate securely with providers. MediTouch ensures effective communication through automated texts and emails. The solution offers an e-prescribing module that includes a prescription renewal process. 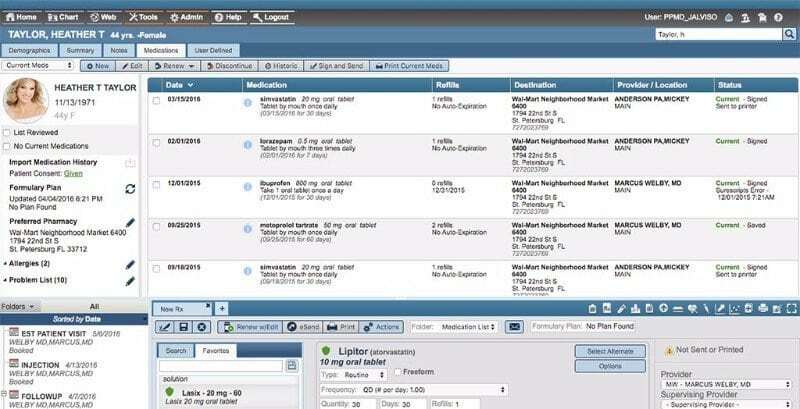 It also provides interactive maps to guide patients to the closest pharmacy. MediTouch supports iPhone/iPad e-prescription and allows users to directly fax to clinic’s document repository. The medical compliance solution offers HIPAA compliant internal messaging system for collaboration between patient, staff, providers, and billers. MediTouch has proven ICD-10 success. Their first pass payer rates have not decreased since October 1 and the ICD-10 transition went seamlessly. MediTouch PM is HIPPA compliant and ICD-10 ready and also meets ANSI 5010 requirements. Centricity Practice Solution is a fully integrated electronic medical record (EMR) and practice management solution used by physicians and administrative staff to increase a clinic’s operating efficiency. Both the practice management and EMR modules can be configured to operate as standalone solutions and have built-in tools that let them connect to virtually any hospital EMR or revenue cycle system. This PM solution provides a web portal for your patients. Through this portal, patients can send messages directly to physicians and staff through a secured, HIPAA-compliant network. They can also request appointments and access financial information, such as billing. It is a very secure medical compliance application for capturing and storing patient and medical institution records and sharing them with other stakeholders. Centricity Practice Solutions and GE Healthcare are committed to providing their customers with the necessary software upgrades to support ANSI X12 5010 version EDI transactions in time to meet the Centers for Medicare and Medicaid Services’ (CMS) final published compliance dates. 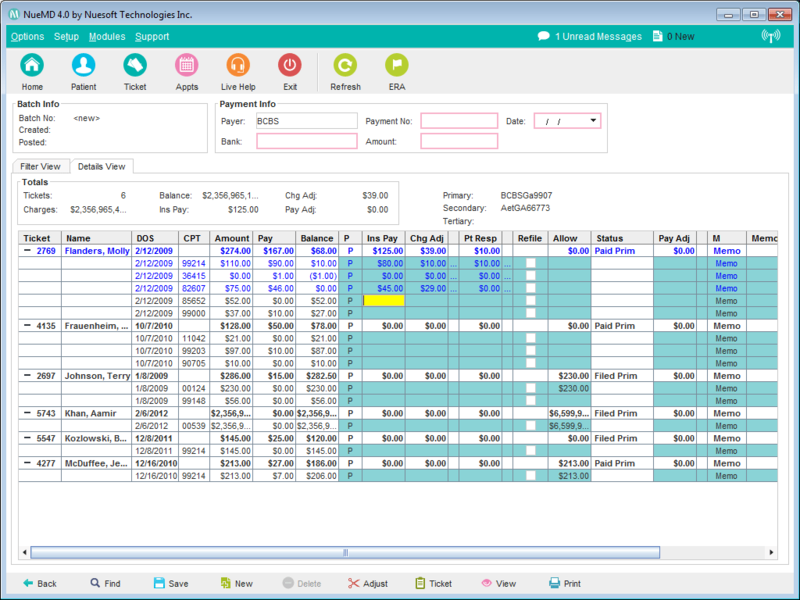 Centricity Practice Solution version 10, which is now in general release, meets the current ANSI X12 5010 requirements. Centricity’s hosting manages all HIPAA compliance requirements at their end, so you don’t have to worry about the security of your data. To support a secure concurrent user model, Centricity stores all user and resource information in Microsoft Windows 2000 Active Directory, which manages permissions for logon to a computer or network. This application takes advantage of Active Directory security and flexibility. It allows users to manage security for all applications, whether from GE or not, from a single network administrative point. Active Directory validates user information such as passwords and security policies rather than requiring the user to store both network and database passwords. Centricity Practice Solutions is ICD-10 and Meaningful Use compliant. It also meets HIPAA 5010 requirements. It uses algorithms or a rules-engine to search across ICD-10 codes for efficient medical coding operations to ensure accuracy and search efficiency. CureMD provides an electronic health record (EHR) solution combined with practice management and billing services. CureMD’s all-in-one platform appeals to practices of all specialties and works best for mid-sized to enterprise practices. With integrated and interoperable EMR software, CureMD EMR allows a practice to focus on health record management and explore how that promotes enhanced patient care. With models for medical billing services, practice management and population health, the CureMD EMR system with EHR software functionality also provides mobile capabilities in order to help healthcare offices find new ways of capturing and presenting patient information. This EHR employs advanced security features and backup systems that prevent data loss while keeping your information secure, private and accessible. CureMD has several specific features which help you manage the security and confidentiality of your information, including provider passwords, locked screens, access restrictions and audit trails. Administrators can utilize permissions-based features in the application settings, allowing hierarchical access to sensitive data. CureMD Practice Management is ICD-10 ready and HIPAA, HCPCS and CPT compliant. This medical compliance solution is also compliant with ANSI 5010 requirements. ANSI 5010 is the most recent update to HIPAA compliance. If users are looking for a surefire way to safely house health record data, CureMD is a good option. NueMD Practice Management software can help a practice deal with revenue cycles, build efficient internal practices and more. This medical practice management software works independently as a part of an office’s IT infrastructure. It streamlines operations with a web-based medical billing model, allowing doctors and administrators a free hand for other kinds of work. Delivered over a secure internet connection, this software operates independently of the web browser and avoids many security risks that its browser-based competitors face. Data security will never be an issue with NueMD — it is ICD-10 compliant, HIPAA-compliant and prepared for the ICD-10 transition. There is also a HIPAA-compliant mobile app for both Apple and Android devices. One of NueMD’s best features is a personalized assessment of your office. Before clients agree to use the service, the company will do a full assessment of your practice free of charge. The assessment evaluates your finances, technology, workflow and other factors that can affect your practice. It then creates a plan to meet the specific needs of your practice to improve operations and properly implement your new software. With this medical billing company, you won’t receive a general plan that it offers to everyone, but a customized strategy to best benefit your practice. In short, NueMD offers secure, HIPAA-compliant access to software that simplifies administrative work and streamlines the patient care cycle. NueMD publishes a variety of content to help other practices achieve medical compliance and is looked to as an industry standard. It is owned by AdvancedMD, whose security protocols are detailed in the next section. 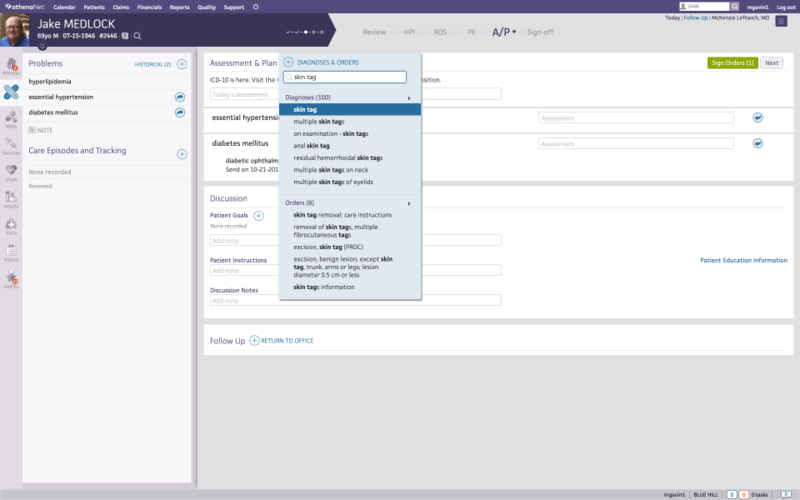 AdvancedMD features all the tools you need to manage your A/R and claims processes in one convenient database. The robust clearinghouse automates manual processes, auto-generated worklists improve productivity and expedite reimbursements, and automatic claims scrubbing gets you an almost 100 percent first-pass claim acceptance rate. AdvancedMD offers the control practices want and need through access to information and charts electronically. AdvancedPM provides automated updates to meet ICD-10, HIPAA compliance and Meaningful Use regulations. AdvancedMD is 2014 Edition compliant and has been certified by an ONC-ACB in accordance with the applicable certification criteria adopted by the Secretary of the U.S. Department of Health and Human Services. As a cloud technology, AdvancedMD is an all-inclusive product and service. In agreement to the AdvancedMD terms of service, the user pays a monthly service fee for a comprehensive product. This certified product version requires a monthly service fee that enables e-Prescribing, computerized provider order entry, formulary checking, interaction checking, VDT (view/download/transmit), clinical information reconciliation, transmit transitions of care, patient education and secure messaging. AdvancedMD is also a vendor of several medical compliance software solutions including HCSI and Compliancy Group. Users won’t need to worry about patient data when it’s stored in the AdvancedBilling databases. V10 of eClinicalWorks is certified by the ONC and compliant with EHR technology certification. This is important in assisting practices with meeting meaningful use requirements for stage one and two, generally promoting the kinds of uses desired by government regulators in the age of digital healthcare. This versatile electronic medical record software tool helps medical provider offices streamline clinical workflows and work efficiently in a high-stakes, high-pressure field. The eClinicalWorks EHR/PM is made to accomplish key objectives in healthcare: its cloud-based EHR design assures doctors and others of competent medical billing procedures, a good interconnected EHR system, and great communications and interoperability for architectures. 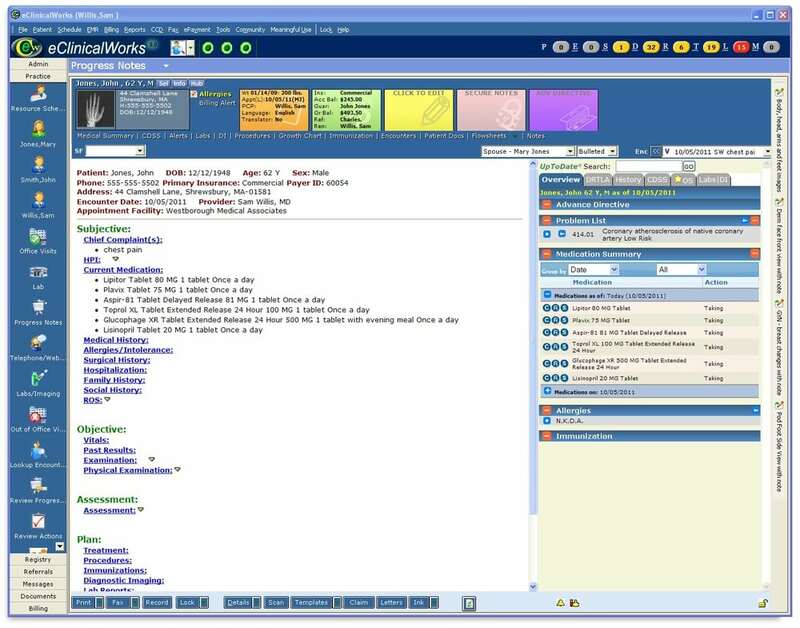 A new feature to the updated version of eClinicalWorks is the medical assistant known as Eva, a smart, voice-activated tool that can recall patient histories, bring up outstanding balances and note comparisons, to name just a few tasks it performs. Eva is said to adapt to providers’ specific workflows as the program gets to know their preferences. 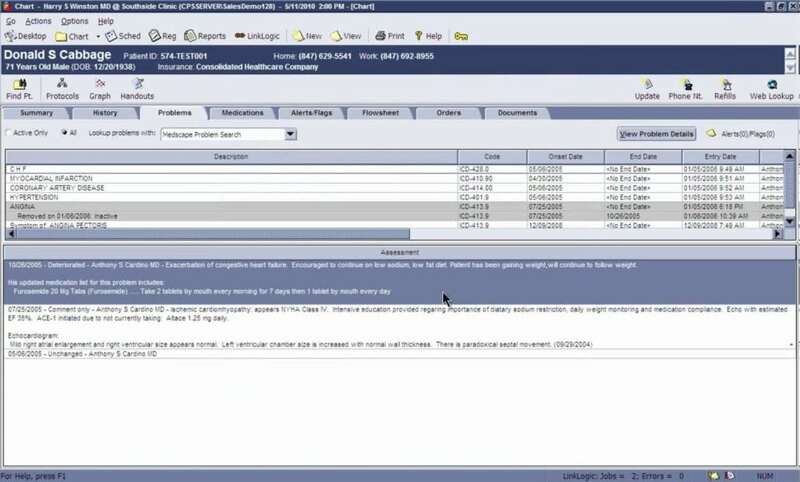 This is one of the few EMRs that offers an assistant tool like this, which distinguishes eClinicalWorks from other applications. If you are switching over from a previous system, the company offers free conversion of your pre-existing data into the new system. The PM from eClinicalWorks supports ICD-10 coding with a tool that cross-supports ICD-9 codes. 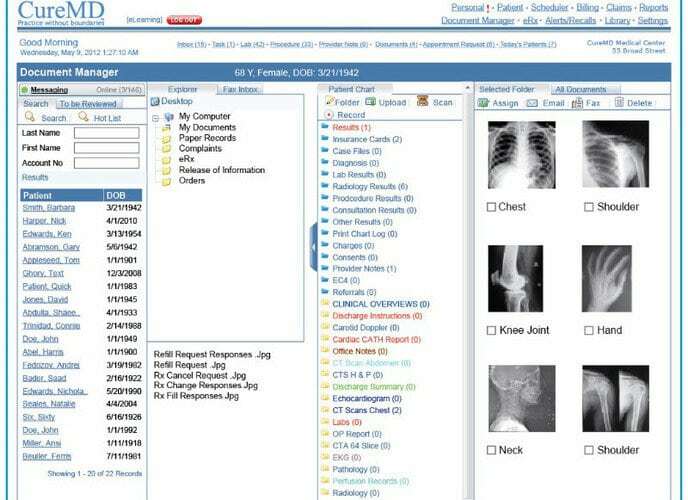 For ICD-9 codes that translate into multiple ICD-10 codes, the software displays all related ICD-10 codes, which you then select. For practices looking to integrate into the ICD-10 standard, this extra feature saves time and ensures proper charting and reimbursement. The solution enables patients to use HIPAA-compliant messaging to send communication directly to staff or physicians. This medical compliance system is compliant with ANSI 5010 requirements and is also certified by an ONC-ATCB board for meaningful use attestation for stage 1 or stage 2. With eClinicalWorks, it’s easy to meet documentation standards so you can comply with federal regulations. The software is web-based, so you don’t have to maintain expensive hardware. With athenaCollector, clients have access to a network of over 75,000 providers, a continuously updated rules engine and back-office teams working on your behalf. Their experts take on your most time-consuming tasks, like claim submission and follow-up, denial management, payment posting, and more, getting practices paid six percent more and 32 percent faster. This system from athenahealth provides cloud-based services for electronic health records, revenue cycle management, medical billing, patient engagement, care coordination and population health management, as well as Epocrates and other point-of-care mobile apps. The platform from athenaCollector automatically updates its databases with the latest and most up-to-date industry standards such as ICD-10 and ensures regulatory medical compliance. The solution is fully compliant with HIPAA 5010 requirements and keeps private data safe from prying eyes. This application also offers secure cloud-based software and flexible support and consultation. This medical billing service provides help and features you can’t find from many medical billing solutions. Users can be confident in the safety of their data — athenaCollector is certified for FIPS 140-2, HITRUST and DirectTrust, PCI data security standards, SOC1/SSAE16/ISAE 3402 and SOC2. Data is encrypted at rest HTTPS and accessed via multi-factor authentication processes. Data is backed up in multiple locations to prevent data loss. 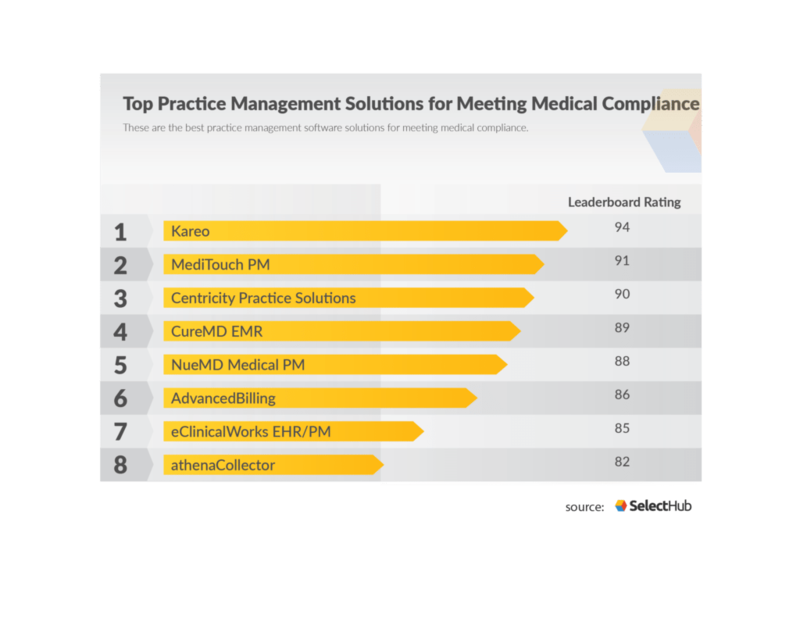 Each of these medical compliance software applications comes with its own pros and cons, so make sure to check out our leaderboard to review the other features they offer. No matter which billing compliant HIPAA medical software you choose, you can rest easy knowing your data is safe! Did we leave any practice management software out? Do you agree with our analysis? Let us know in the comments!